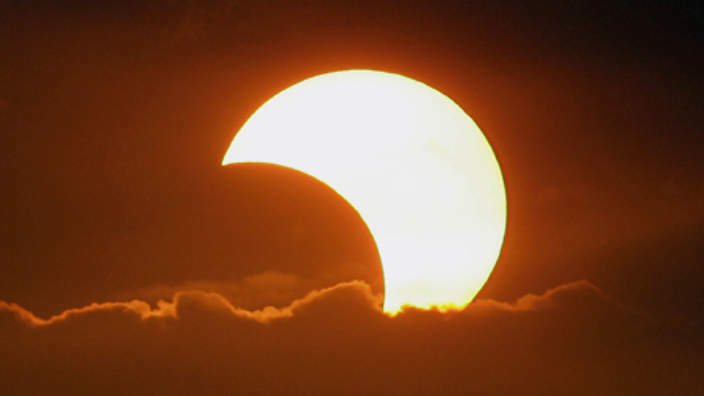 Swinburne University of Technology astronomer Dr Alan Duffy said Australians have been fortunate to view a solar eclipse almost annually over the past few years, but a part from tomorrow won’t have a chance to see the Sun so covered up by the Moon again until 2028. Eclipses are one of Nature’s greatest visual spectacles and a powerful reminder that our Solar System is a dynamic and ever-changing place. For astronomers the eclipse is a great opportunity to learn about the corona, the outer edges of the Sun’s atmosphere, which would normally be outshone by the rest of the Sun. Although this is only a partial eclipse it should still be quite a show. “By viewing this eclipse you will be part of a tradition of eclipse watching here in Australia that dates back millennia, as Indigenous Australians were well aware that the Solar Eclipse was the Moon passing in front of the Sun, as distinct from a Lunar Eclipse, which occurred a few weeks ago, when the Moon is behind the Earth. Please do not look directly at the Sun. Even during an eclipse it is still easily capable of blinding you. Instead you can either use ‘eclipse glasses’ from your local planetarium, create your own pin hole camera, or even use a colander like you would to drain rice or veggies with, to get multiple images of the eclipse (always watching the shadow it casts). “If all else fails and you’ve forgotten to bring something, just spread your fingers and place one hand over the other at 90 degrees to make lots of little square gaps between your fingers and look at the shadow that they form on the ground, ” Dr Duffy said.